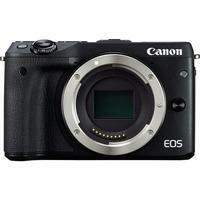 Canon EOS M3 is a mirrorless interchangeable lens camera that continues success of EOS M with a larger 24.2-megapixel APS-C sensor and powerful DIGIC 6 processor to ensure a quicker, more responsive AF performance when capturing stills and video. In terms of styling, M3 is almost identical to its predecessor with addition of a wheel dial for making quick manual adjustments, a slightly larger grip and a 3.0" touchscreen that's tiltable 180°. Additional features include Wi-Fi connectivity, 4.2 fps burst shooting, Creative Assist, a built-in flash and hotshoe, plus an external microphone socket.